I'm an active hiker, snowshoer, skier, and of course backpacker. Home base is the Southern Colorado Rockies, ranging from alpine tundra to pi�on-juniper scrub and desert at lower altitudes. Many of my backpack trips are two or three nights (sometimes longer), and I usually shoulder about 30 lb (14 kg). My style is lightweight but not at the expense of enjoyment, comfort or safety - basic survival gear plus extras like a camera and air mattress make my trips safer and more pleasurable. Eagle Creek's Pack-It Compression Cube Set is a pair of stuff sacks with zippers for packing loose gear - clothes or any kind of soft travel accessories. 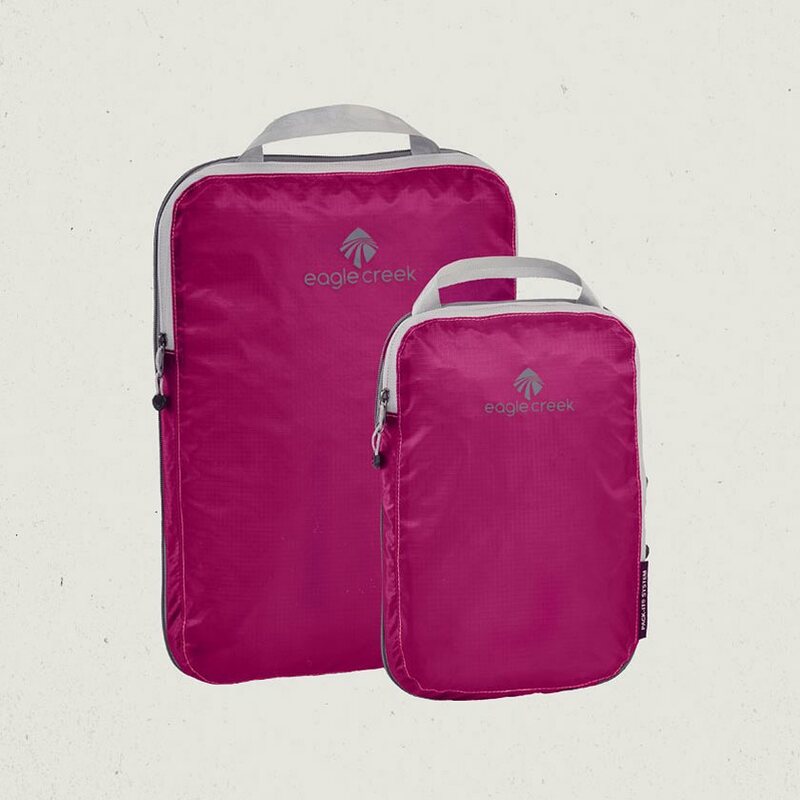 They are designed with a nylon coil double zipper system - one zippered opening for inserting your stuff into the single main compartment, while the second zipper expands or contracts the total capacity as needed. Eagle Creek calls the large size (7.5 L) a "cube" and the small (3 L) is the "half cube": they are identical in appearance and functionality except for size. Both are made of ripstop silnylon material and have a carry handle at the top. The accompanying hang tag states that the Cube Set bags are stain and water-resistant, and washable. The first thing I do with a new bag like this is test the zippers, because if they're not sturdy and well-made the bags won't last long in use. On first use I found them easy to use and they seem like they'll hold up under pressure - especially the longer circumferential zippers that form the compression closure against the bag contents. As is always the case with zippers on thin material, I had to watch that the nylon doesn't snag in the teeth, which could take a bit of practice when my bag is stuffed to capacity. I grabbed some t-shirts and socks for a quick test, and found that closing what I'll call the "insertion zipper" went without a hitch. This zipper has smaller teeth than the compression one, and fabric covers the teeth when closed. It's designed to open the bag across the top, from about 2 in (5 cm) down from the top edge on one side to about 6 in (15 cm) down the other side, making a good-sized opening into which I stuffed my clothes. Depending on how much I'm putting into the bag, while inserting contents the compression zipper can be closed, partially unzipped, or completely open. But once I've got the insertion zipper done up, I pressed down on the center of the bag to help zip the compression closure, being careful not to the snag the bag material in it. Both bags are lightweight, and their silnylon ripstop construction feels durable; all stitching looks evenly done without any loose ends or threads that I can see. Each built-in metal zipper pull is large enough to easily grab with my fingers, but they also have an extra nylon/plastic pull attached to them to make it even easier to get a hold of. Although these bags appear to be designed for mostly soft items like clothes, with care some harder-edged gear might be stored without damaging the silnylon; that will be part of my test. I'm looking forward to using the Pack-It Compression Cubes in my daypack and backpack, and for some non-camping travel that I have coming up during this fall season. I've been using the small Pack-It Compression Cube continuously in my day pack since the test began in early October, for more than 20 day hikes and about 100 mi (160 km) total distance hiked. I keep a small collection of essential gear in it, such as a flashlight, first aid kit, water purification, etc. The large Pack-It has seen less hiking use, but I did use it once for a 2-day backpack and a couple of overnight non-camping trips. Since the large and small Pack-Its are identical in functionality, my observations about how easy they are to use apply to both. The zippers ran smoothly, with the only problem being when the sacks were stuffed very tightly. I found I just needed to work the zipper slowly down its track while helping along the compression with my free hand, plus pressing the inner nylon away to keep it from becoming snagged. I don't count this against the Cube's design, but I do credit the smoothly running zipper that made closing the tight sack easier than it might otherwise have been. I liked having two different zippers on the Pack-It: one for opening/closing the sack itself for its contents, and another for the compression. Sometimes I'd leave the compression zipper unzipped when I knew I'd be reusing the sack a short time later and didn't want to bother re-compressing it. I found both Pack-Its to be very durable so far and didn't see any issue with wear for either the nylon fabric or the zippers. The fabric is silnylon, which is not as durable as other nylons; however, it is ripstop and so that probably accounts for its durability so far. At this point I also don't find any loose threads or fraying. The bright magenta color of both of my Pack-Its was not my first choice, but after a while I appreciated it - especially in my day pack. The magenta let me find the sack more easily while digging around inside my loaded daypack even in low-light conditions. I've gotten good use out of my small Pack-It Compression Cube - it's been in my regular day pack for practically this entire test period. It holds some of my day trip essentials in a tight package to save space, yet it's convenient to open and retrieve the contents. I like the option of using the compression zipper to minimize space, yet I can also leave that zipper open and just use the access zipper to keep everything in place. Although the large Cube has seen less use for me, it has the same advantages as the smaller model but stores more stuff. A big thanks to BackpackGearTest.org and to Eagle Creek for the chance to test the Pack-It Compression Cube Set.